Around 1850 a settlement was established along the shores of Dickinson Bayou. By 1860 Dickinson became a stop on the Galveston, Houston and Henderson Railroad. The town had a post office in 1890 registered under its current name. In the 1890s Fred M. Nichols, the son of E. B., and eight other businessmen organized the Dickinson Land and Improvement Association to market unoccupied land in the Dickinson area. The primary attraction was the local soil’s proven suitability for growing fruit, cane, berries, and potatoes. Nichols converted forty acres of his estate into a public park, the Dickinson Picnic Grounds. For the next three decades large groups came out from Galveston to picnic and holiday on the grounds. A Texas Coast Fair was organized there in 1896, and a harness racetrack (where the great harness champion Dan Patch supposedly ran) was built to attract more people to Dickinson. By 1911 the Galveston and Houston Electric Railway Company had three stops in Dickinson, and prominent Galvestonians had established the Oleander Country Club and built homes there. Industrialization and the growth of the oil industry in the Houston and Galveston area after both world wars contributed further to Dickinson’s growth. More growth came with NASA’s establishment in 1962 of the Lyndon B. Johnson Space Center just north of Dickinson in Clear Lake City. The fluctuating population figures of the town reflect these influences. Dickinson had a population of 149 in 1904. In 1914 the town had a population of 250, twelve businesses and a bank. After World War I the population had risen to 1,000; it dropped to 760 in 1931 but rose again to 1,000 in 1933; it remained stable through the rest of the Great Depression years. During World War II it rose to 1,500. By 1952 it was 3,500 and by 1961 increased to 4,715. 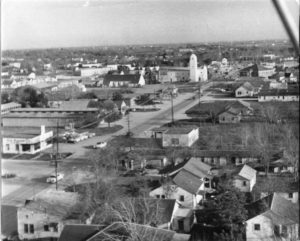 By the 1970’s the cities of Texas City and League City, through aggressive annexation, began to encroach on Dickinson. Residents of the central area worked to incorporate the city in 1977. In 1990, the additional areas of town were annexed into the incorporated city. In 2012, the estimated population of the city was 19,092.